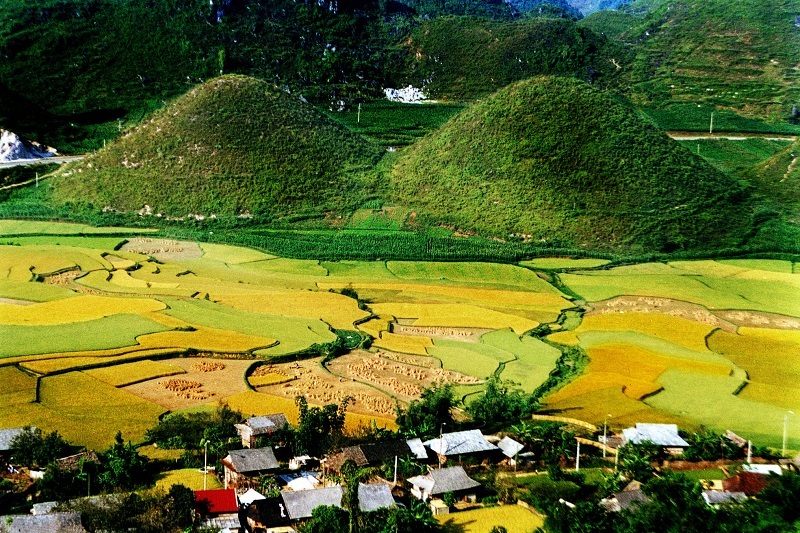 Twin Mountain is situated along Highway 4C and is approximately 40km from Ha Giang Town. The mountain is a part of Quan Ba District, Ha Giang. At a distance, Quan Ba Twin Mountain resembles two cherries. The mountain has an interesting legend behind it. From a distance, Quan Ba Twin Mountain looks like two cherries as an art of nature. The mountain associates with a touching legend. Visitors have the opportunity to admire the art of the nature give to this land. Between the mountain and rice terraces, there have mountains with strange shape that make visitors surprise by the spectacular beauty of the nature. Two mountains associated with the legend “Co Tien Mountain” very interesting. It is said that, in this area, there has a handsome H’Mong and have talent blowing “dan moi”. Sound of “dan moi” flies and flies away forever. There has a fairy in heaven with name “Hoa Dao”, she hears the sound of “dan moi” and tries to find the way to come the earth. And she falls in love with him. He became the husband of the fairy. Ngoc Hoang found Hoa Dao fly to the earth, which makes him angry. She begged to have custody of baby boy but could not do it. So that she had left her breast to her son. Later, her breast turned into twin mountain of Co Tien Mountain. According to the legend, the milk from her breast creates the cool climate, fruits and vegetable has delicious flavors. Tears of her turned into Mien River, embracing the silvers of land behind the legendary gate. Quan Ba Twin Mountain is a beautiful symbols of the Dong Van highland, which is the crystalline beauty of nature and tectonic. With this value, the mountain is recognized the national scenic spot by the Ministry of Culture Sport and tourism Vietnam. The visitors of Ha Giang cannot help but admire the raw and natural beauty of the twin mountain. A visit to Ha Giang would be incomplete without a stop at the twin mountain.